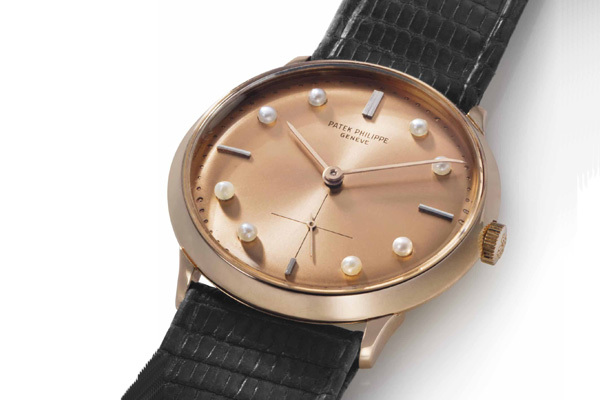 A rare 1958 Patek Philippe watch has been auctioned off for CHF 250,000 ($253,360) at Christie’s Rare Watches auction, which was held at the Four Seasons Hotel des Bergues last month. Labelled 'The Pearl of Bahrain', the watch is one of Patek Philippe's most remarkable time-only pieces ever made. Featuring a pink starburst dial, the unique piece uses natural seed pearls harvested from off the coast of Bahrain to mark each hour. The top lot of the section and the entire sale was Patek Philippe’s “Grand Complication” reference 5208P selling for CHF750,500 ($760,587). It is one of Patek Philippe’s most complicated wristwatches ever made, offered exclusively to the firm’s top clients. Preserved like new, the present platinum reference 5208P is only the second example to come to auction. The Property of an Important Swiss Private Collector, lots 136-182 includes 47 mostly contemporary wristwatches compiled by the Swiss collector over the last decade and was highlighted by the two Richard Mille watches – first, RM011 R. Grosjean Lotus F1 Team selling for CHF187,500 ($190,020) and secondly, the RM030 Argentina Especial Limitata No. 26/30, which achieved CHF 118,750 ($120,346). The entire collection totaled just under CHF 1.2 million ($1.21 million). Overall, Christie’s Rare Watches auction totaled CHF12,241,750 ($12,406,300).